This 90-minute intensive telephone consultation will enable you to discover exactly where you are now on the optimum health scale. Are you actually doing better than you think, or are you needing emergency attention to save you from your own life? It’s time to find out! During our 90 minutes together I will ask you a wide range of questions about every aspect of your life. Through these questions, I’ll be assessing where you’re at in relation to all aspects of your health and overall wellbeing, and digging deep into finding out just how many responsibilities you have on your plate right now and the extent to which they’re draining you. Previous Health Goal Setting Session clients have consistently reported being amazed at what was unearthed during this session – things like “I can’t believe I said that!” and “I didn’t realise just how much I was dealing with” are commonly heard during these calls – and that’s before I even share with them their Health Heroine Ranking or their LifeLoadTM Score! Your Health Heroine Ranking – Here’s where you currently sit on a scale of 1-10 in the area of your overall health and vitality. Knowledge is power. When you know where you stand, you know how far there is to go. And when you know what’s possible, you’ll feel inspired to get there! Your LifeLoadTM Score – Right now you probably already know that you have plenty on your plate – in fact it’s probably overflowing – but have you really gained a fair assessment and perspective on just how much it is? Your LifeLoadTM score will reveal to you exactly how much you’re currently dealing with – and if your score is 7 or above, there’s no doubt about it – you need The Health Heroine and there’s no time to lose! Your Top 3 Health Challengers – Once I’ve found out everything I need to know, it will be clear to me which three things, if you were to transform them or eradicate them from your life, would make ALL of the difference for you. By getting clear on what these three things are, you will know exactly where you need to place your attention in order to get back in control of your life and start looking and feeling as wonderful as you would love to look and feel. Clarity changes everything and clarity will give you what you need to move forward with confidence that you CAN have the life, looks and energy levels that you desire. Your Top 3 Heroic Goals – It’s great (and imperative) to have clarity around what your challenges are, but there’s one more step: getting clear on what specifically needs to happen in order for change to occur. During the last part of our session, I will assist you in getting clear on the most powerful three goals you can set for yourself in order to create that transformation, together with the best first step to take in relation to each goal to set you firmly on the path. As you can see, there’s so much to be gained from investing in a Health Heroine Goal Setting Session. You’ll be amazed at what will become clear for you and what that can enable. After just 90 minutes you will have a perspective and reality-check on your life that you’ve probably never had before. If you have reached your “enough is enough” moment and you KNOW that things have to change, then this session is the most powerful catalyst and significant step you can take in order to begin that vital process of change. 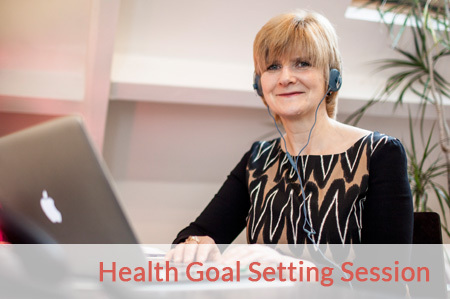 Your investment for a Health Heroine Health Goal Setting Session is only £95 for the 90 minute consultation and all of the above deliverables. Within 72 hours of our session completing I will email you a short but invaluable written report containing a summary of where you currently stand in relation to your Health Heroine Ranking, your LifeLoadTM Score, your 3 biggest Health Challengers, the 3 SMART (Specific, Measurable, Achievable, Realistic and Timely) Heroic Goals that would best assist you in overcoming those challenges, and the first step to take in relation to each of those goals. If, at the end of our session you decide that you would like to continue on with me to assist you in reaching the goals we have defined, then we can discuss the opportunities available to you that will help you get to where you want to be. If you choose to work with me in any of my 1:1 coaching programs, as a special reward for your commitment to yourself and your amazing future self, your initial investment in the Health Goal Setting Session will be deducted from your investment. *NB: All US prices quoted are approximate owing to currency fluctuations beyond our control. We have done our best to represent the latest figures, but please understand that your final payment may be above or below that quoted above depending on the currency price at time of purchase/billing.